Hemkund is surround by seven snow covered peaks and their reflection in the bluish-green water is a picture to behold. The lake is a great pilgrimage place for the Sikhs. In the Guru Granath Sahib. Guru Govind Singh made a reference that in one of his previous births he had mediated on the shores of a lake which was surrounded by seven snow covered peaks. In 1930, Havildar Sohan Singh discovered this lake, and identified it with the one referred t in the Guru Granth Sahibji. On arrival, assistance and transfer to hotel. After lunch, half-day visit to Gurdwaras Sisganj, BangIa Sahib and Rakab Ganj. Dinner and overnight at hotel. After breakfast, drive by car/coach to Rishikesh. Check-in and lunch at hotel. Visit the Laxman Jhoola, Muni-Ki-Reti and the local Gurdwara. Dinner and overnight at hotel. After breakfast and a short visit to Gurdwara, drive by car/coach to Joshimath, lunch enroute. Dinner and stay at Tourist Rest House. After breakfast, drive by car/coach to Gobindghat (18kms/l hrs), situated near the confluence of roaring Laxman Ganga and Alaknanda rivers called Vishnu Prayag. Lunch at gurdwara. 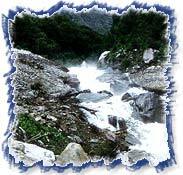 A 14kms trek us to Ghangariya, the base camp for Hemkund Sahib. Dinner and overnight at Tourist Rest House. After breakfast, treak to Hemkund Sahib, 4239m above sea-level (5kms/3hrs). Guru Gobind Singh, the tenth guru of Sikhs, is believed to have mediated here in his previous birth. A gurdwara stands here in his memory on the bank of a sacred lake. Return to Ghangariya for dinner and overnight stay. After breakfast, trek to Valley of Flowers (4kms/2 ½ hrs), carrying packed lunch. 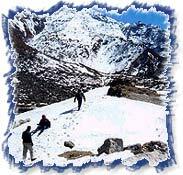 Explore the valley and witness the rare Himalayan flora, i.e. Brahm Kamal (Saussurea Obvalata), Himalayan Blue Poppy (Meconnopsis Aculata) and many more. Return to Ghangariya for dinner and overnight stay. Day 07 : Ghangariya - Gonindghat - Joshimath After breakfast, trek down to Gobindghat. Lunch at Gobindghat and drive back by car/coach to Joshimath for dinner and overnight stay at Tourist Rest House. Day 08 : Joshimath - Rishikesh (290kms/10hrs) After breakfast, drive by car/coach to Rishikesh. Lunch at Shrinagar's local restaurant. Check-in, dinner and overnight at hotel. After breakfast, drive by car/coach to Delhi. Enroute visit Har-Ki-Pauri at Haridwar. After Lunch, continue journey. Check-in, dinner and overnight at hotel. After breakfast, transfer to airport for flight to onward journey/back home.